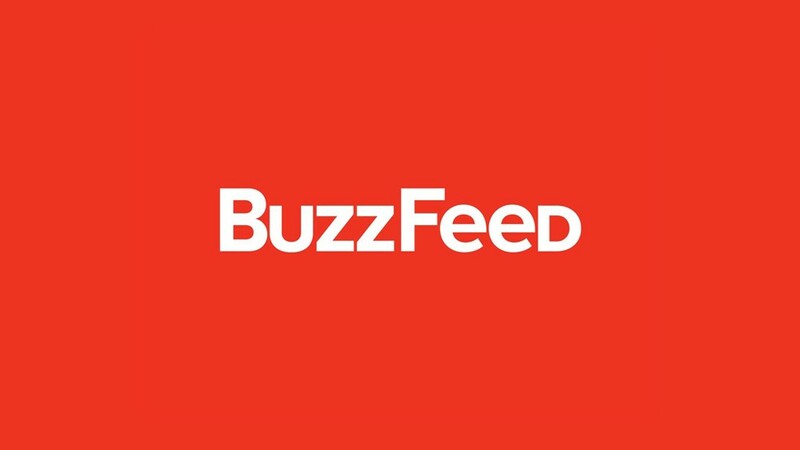 As most of us may already know, Buzzfeed is an American Internet media company that provides a wide range of topics, including social and breaking news along with entertainment, focusing on digital media techniques. Founded in 2006 by Jonah Peretti, the company was developed to create and distribute viral online content. Buzzfeed is also known for its online quizzes and articles about pop culture. However, it has been expanded, approaching an informational model, by adding long-form journalism and reportage in its content. Accordingly, it attracts more and more users from all over the world. It has turned into a global media and technology company, providing viral content through many different platforms and applications. That fact, makes it interesting to discover its business model. To begin with, Buzzfeed is generally targeting readers who want to get informed and entertained, from all over the world. In other words, it is aimed to provide mostly trending topics for general consumer population. Furthermore, it offers some advertising solutions to advertising agencies and marketers. Buzzfeed provides value to its customers in various ways. Firstly, by offering a wide variety of content including politics, social issues, sports, music, videos, quizzes and many other things. Also, there are so many channels that make it really easy for all these things to be accessible. The content is also available in a number of different languages (French, German, Spanish etc.). In that way, it creates a big audience in a community that users are able to create content and meet others with the same interests. In these circumstances, marketers are able to promote their products and brands. Buzzfeed’s content is also available in its social media accounts, from which it generates a lot of traffic for the website. As for the channels, first of all it operates its website at «www.buzzfeed.com». It allows people to get informed about its activities and it is accessible through mobile and desktop browsers. As for the mobile ones, users can get in touch with Buzzfeed and its community via many applications including the BuzzFeed app, the QuizChat, BuzzFeed News, BuzzFeed Video, and Cute or Not app. An interesting fact is that the 70% of the users are activated via mobile devices. Also, it maintains a network of 18 offices globally, including across North America, Europe and Asia Pacific, where it hires staff to handle its business with advertising customers. Buzzfeed definitely maintains a strong relationship with its users. 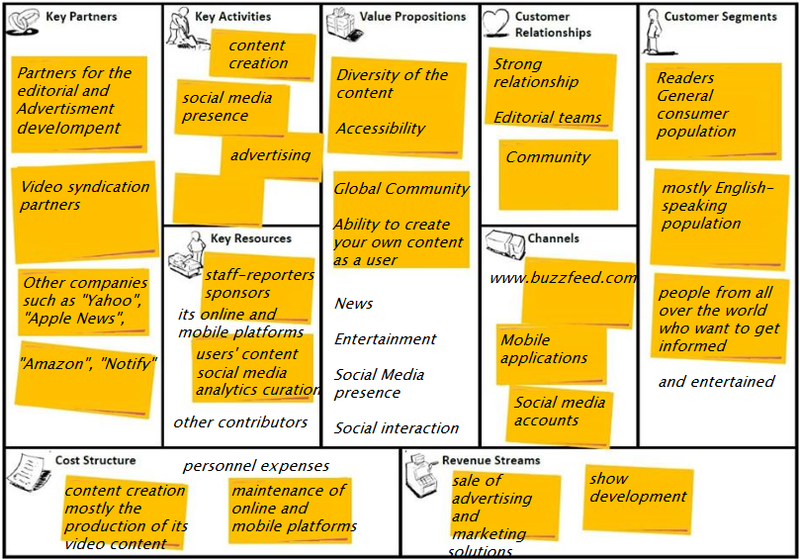 It is based on a community model that allows interaction with them, by creating their own content for the platform. In addition, it always asks for their feedback and provides them the ability to make an editorial team via online contact forms. As for the key activities, Buzzfeed operates a multichannel model that provides content creation and more specifically coverage of a wide range of topics, as we have already mentioned, including politics, sports, travel etc. Its content is available for free and also accessible through different platforms and devices. Also, it has a strong social media presence that allows interaction with users. This interaction is actually one of the main features of the platform. Moreover, it maintains a native advertising model, for brand marketers. In order to accomplish these activities, it has built a lot of partnerships, by collaborating with a range of organizations. Its partners include supplier and service partners, for each function, editorial and advertising partners, such as brand marketers that provide content for the platform’s users and other development partners, especially for the video content, which is very essential for the company. Additionally, Buzzfeed has made other partnerships that include big media organizations and companies such as CNN, Netflix, Apple News, Notify and Flipboard, in order to develop its content even more. Like every big company, Buzzfeed has a lot of key resources. One of these is first of all the platforms (internet and mobile). Secondly, what Buzzfeed needs in order to be “alive” is its staff, in other words the content creators, reporters, IT support, sponsors, partners and contributors. Another big resource is the user’s community, and its social media accounts. These things are vital for its commission. Most of its costs are related to its content creation and consequently to its personnel, partners and generally to the maintenance and development of the online and mobile platforms and even more to the creation of the video content. Finally, Buzzfeed generates its revenue mostly from the sales of marketing and advertising solutions. As we have already noted, it is based on a native advertising business model that is charging consumers (brand marketers) for creating content targeted to their customer base. Conclusively, its revenues are also coming from its show development. For instance, Buzzfeed has launched brands such as «Τasty», which is a food show gaining more and more popularity worldwide. So it appears that this company is following an intelligent business strategy, isn’t it?